Add a configuration profile that defines the configuration for DataStax Enterprise (DSE) clusters. 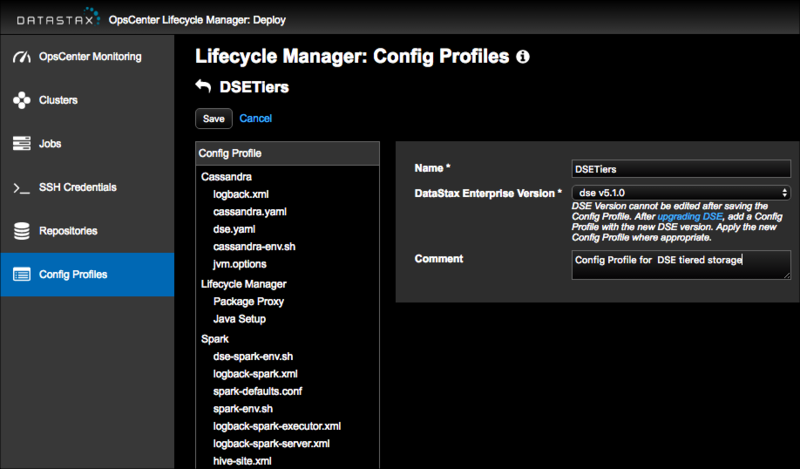 The configuration profile informs Lifecycle Manager which supported version of DSE to install, configure, and manage. When performing a DSE upgrade across major versions outside of Lifecycle Manager (LCM), you must add a new configuration profile that reflects the actual version of DSE installed, and then update your clusters, datacenters, and nodes to use the new profile where appropriate. To prevent any potential loss of settings between different versions, the DSE version cannot be edited after saving the configuration profile. Cloning a configuration profile allows changing the DSE version, and facilitates upgrades with notifications of any setting changes. Important: LCM install and configure jobs fail if the installed DSE version does not match the version specified in the configuration profile associated with a cluster, datacenter, or node. Install jobs also fail if the operating system is not supported by the DSE version, unless platform checking is disabled. The Config Profiles page displays. Enter a Name for the configuration profile. The name of the configuration profile displays on the main Config Profiles page where you can edit or delete the profile, and within the Config Profile lists of the Add/Edit Cluster, Datacenter, and Node dialogs when associating the configuration profile with a cluster, datacenter, or node in the Clusters workspace. 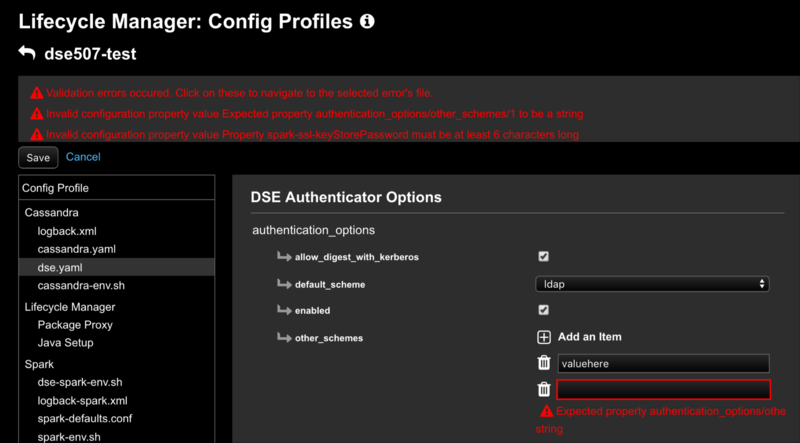 Select the supported version of DSE to associate with the configuration profile. Note: The DSE Version cannot be edited after saving the Config Profile. If manually upgrading DSE (externally from LCM; only recommended for upgrading to a major release version), you must add a Config Profile with the new DSE version. Apply the Config Profile where appropriate to a cluster, datacenter, or node. The Config Profile pane populates with the configuration files and their corresponding options for the selected DSE version. Optional: Enter a comment about the configuration profile. For example: DSE 6 Graph. Optional: Select configuration files in the Config Profile pane to modify default values. A subset of the configuration options are available for overriding defaults for each configuration file. If you click Save without overriding any defaults or customizing settings, the configuration profile is created with standard and sensible default settings. You can continue to edit the configuration profile file and run a configuration job at any time. The newly added configuration profile is listed on the Configuration Profiles page. An edit, clone, and delete option are available for each configuration profile. Continue customizing the sections of the configuration profile as appropriate for clusters, datacenters, or nodes.